Camille. Charley. Ivan. Rita. Katrina. All names that will live in infamy if you live on the gulf coast of the United States. 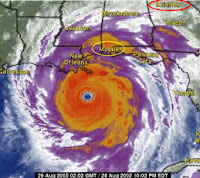 Perhaps none bring the fear factor into play more than Katrina. The repercussions from that hurricane are still being felt as I type this blog entry. Yes, it’s that time of year again. The first official day of hurricane season is today. And, as if on cue, the first tropical storm of the season formed yesterday, Tropical Storm Arthur. Arthur is the remains of the Pacific Tropic Storm Alma. As usual, the National Hurricane Center is predicting an active hurricane season. I’m not sure how they predict these things. But, their predictions have been extremely far off the mark the past two years. I am hoping they continue to have a bad record at predicting an active hurricane season. I’ll be more in tuned to weather reports on TV (I won’t be watching the sensationalist channel aka The Weather Channel). I’ll be stocking up on canned goods, bottled water, batteries and all the emergency tools one needs to prepare for a hurricane. It’s something we all hope will not happen. But, we all know it very well could be a bad season. Prepare for the worst and hope for the best is the motto while living on the gulf coast. I’ll also be checking with my homeowner’s insurance company to make sure everything is up to date. Thanks to our beloved governor’s giving in to the insurance companies, we have to pay a deductible of 2% of the mortgage of our homes. In 2005 I had to fork over $2680.00 before my insurance company would start sending the checks to the roofers, plumbers, sheetrock hangers, etc, ad nausem. I just don’t know where I’m going to get that kind of money again if we have another Katrina (God forbid) this year. You can basically forget getting any kind of help from FEMA if you have homeowners insurance. They will not lift a finger to help you. The Red Cross did help us monetarily by issuing a $600.00 check to us. That did help alleviate the burden somewhat. But, you have to stand in a line under a sweltering sun in order to get the money. I can’t tell you the number of people that passed out waiting in line in September of 2005. There has to be a better way. I also don’t want to forget about the Mennonites who were the absolute first people who made their way into our city after Katrina. They were here even before any state or federal emergency personnel. In fact, the storm wasn’t completely over before the Mennonites started erecting tents in order to pass out food, water and other perishable items needed. We would appreciate all prayers for our well being this year!